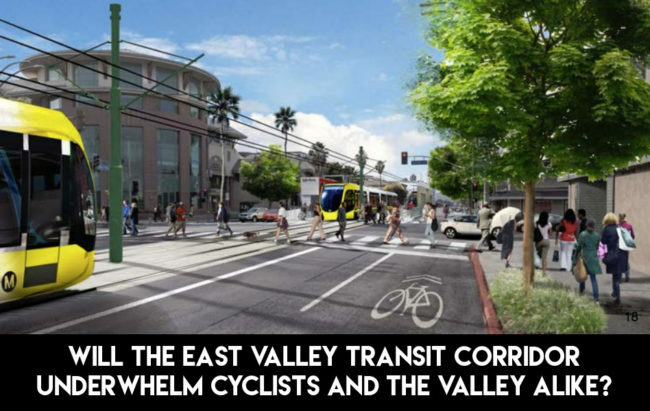 Will the East Valley Transit Corridor Underwhelm Cyclists and the Valley Alike? I love transportation news, especially concerning the Valley. We’ve been underserved how tax dollars have been distributed in the past and Measure M is supposed to help make things right. While the proposed conversion of the Orange Line BRT as part of this money is a whole another issue to swallow, the East San Fernando Valley Transit Corridor has been one that’s worth interest. I would say we have poor connections everywhere, but serving Van Nuys all the way up to San Fernando would really help the population that’s most transit dependent in the 818. Last week, Metro released their EIR on the project which brought excitement to transit nerds (and you too). Obviously, Light Rail is the Gold Standard as the fastest and most voluminous way to move people over this 9.2 mile corridor. It also is the costliest option and the only one that goes over the project’s budget allotment. Part of that is the portion that will go underground which is completely necessary dealing with the pre-existing train tracks at the Van Nuys Amtrak Station. After this, we are left to look at slower and clunkier BRT and Street Car options that will do little to entice those that drive to get out of their cars. The one thing all these options promise are less bike lanes as current ones on Van Nuys Boulevard and the future ones listed in Mobility Plan 2035 will be voided. Even if you look at all the project proposal pictures there’s not a bike lane in sight and the only cyclist featured is happy to be riding on his own sharrow. Bike and pedestrian connections to transit were supposed to play a big part of Measure M, but we’re seeing a real lack of commitment to these investments especially in the Valley. Yes, I know this is a Metro money versus a City of LA issues, but what cycling improvements have you seen around transit here in the Valley? This project is bound to bring more development along this corridor which needs be supplemented with better active transportation options to get there. My fear is that this money will not be used for productive infrastructure and instead continued to be put towards bloated and superficial safety projects, like the $27 million Universal City Bridge. I hope for the best, but the honeymoon has to end at some point. Fortunately, there are people out there that want to look closer at this and I’ll be doing my best to coordinate their efforts. The Valley deserves better than this. We’ve already paid our share. September 23, 9 a.m. to 12 p.m. – St. Mark’s Episcopal Church, 14646 Sherman Way in Van Nuys.